If you run a Facebook Page, you may have recently received a message from Facebook about updates to notifications. Basically, you now receive Facebook Page notifications into your Facebook Fan Page Inbox. Notifications about comments, reviews, and posts can now only be managed in your inbox. They will not longer appear in the notifications tab. 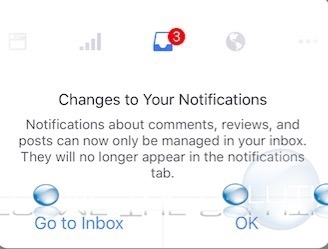 Does this mean the Facebook Notifications tab will go away? Do we have a choice on this? In either case, we think this is a terrible idea. There should be separate areas to manage Facebook Messages and Facebook Messages. I do not want to check my inbox thinking I have a message when in fact it’s a silly notification. Facebook needs to bring more granularity for managing Page Notifications because they are out of control right now. In addition, it would be nice to completely turn off page notifications. Note: Facebook was previously testing the new notifications to inbox feature and had allowed you to switch between old and new versions. Now, it seems this is a permanent change they are rolling out slowly to all Facebook Pages. Since the update of version 95.0 I've lost the message icon which used to be top right hand on the Facebook app for iPads. Maybe you could change the color of unread notifications on Facebook, like maybe to RED! Instead of the current blue. Maybe you could change the color of unread notifications on Facebook, like maybe to RED! Instead of the current blue. I cannot make comments on my friends posts on Facebook any more. Why? What are the Best Windows 10 VPN Services?